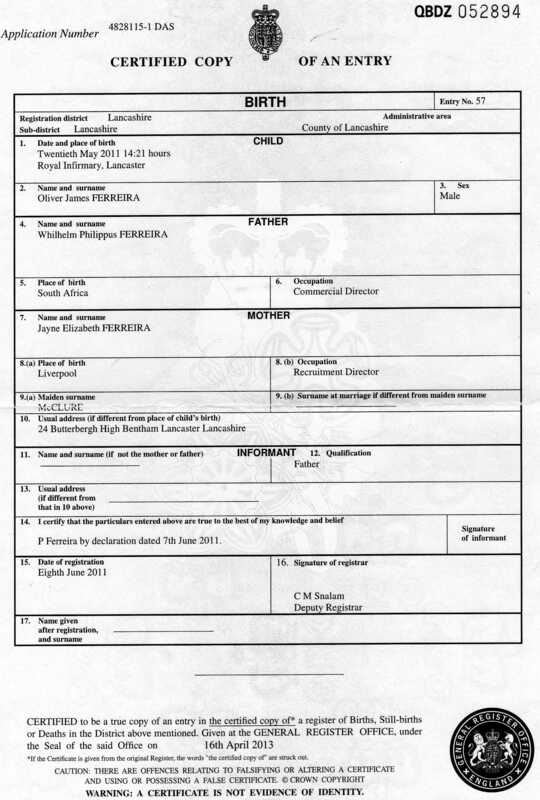 Please find above your Birth Certificates , should your paid surrogate Jayne Elizabeth Ferreira aka as Jayne Elizabeth McClure , change your Family name I will repost these weekly and tag with both names to ensure you will know the Truth one day …. I should also get your South African passports in the next couple of weeks so will post those on here also with your copy UK passports I have now and your confirmation of duel citizenship. Please also note the date in April 2013 when these certificates were issued, the Court and your paid surrogate really underestimate my intelligence . Love you always Little Men .. This entry was tagged Jayne E Ferreira, Jayne E McClure, Oliver and Oscar, Oliver and Oscar Ferreira, Oliver Ferreira, Oscar and Oliver, Oscar Ferreira. Bookmark the permalink.